I HATE cleaning my makeup brushes. It is a necessary evil, both for Professionals and Non-Professionals alike. However, clean brushes means better makeup application and, more importantly, no nasty bacteria lurking in your brushes to cause skin breakouts and general nastiness. I spot clean my brushes every day, apart from the ones I use for applying cream/liquid products; I wash these to ensure the maximum product removal. I do a deep clean on brushes I have used either once a month or before a job, depending on which comes first. There are times when the brushes are being washed a few times per week so, as you can appreciate, I need a product that is going to save me time and be gentle on the brushes/leave them feeling conditioned! The worst thing about doing the deep clean when you have a large selection of brushes is the sheer amount of time it takes to get the brushes clean. 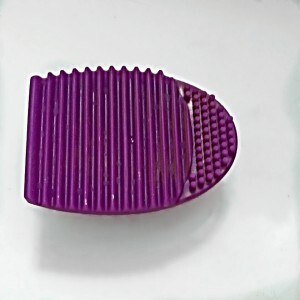 There are some products that just do not want to come out of the bristles. I have noticed, especially on brushes with lighter coloured bristles, that after many uses, despite washing, the bristles are stained. Face brushes, especially the densely packed buffing brushes or flat foundation brushes and brushes that have had dark colours on them regularly are the worst. For the spot clean I use either Makeup Revolution’s Pro Hygiene Anti-Bacterial Brush Cleanser (shop it here) or 70% Isopropyl Rubbing Alcohol (widely available). I prefer to use Makeup Revolution’s product as it is specially formulated for the job at hand, smells beautiful and, I feel, is less harsh for daily use on the bristles. For the deep clean I have used all manner of techniques and products to try and get my brushes spotless; ranging from baby shampoo, washing up liquid, specially formulated brush shampoo, warm water and vinegar, etc. And, while some of these techniques and products worked better than others, none of them got the brushes really clean. I find it really disheartening turning up to a job with brushes that I know are clean (because I was the one that spent hours cleaning them) but the bristles still look dirty. 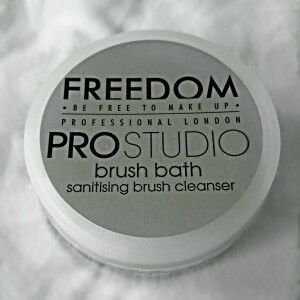 When I saw that Freedom London (website link here) had released their Pro Studio Solid Brush Cleanser (shop it here) earlier this week, I’ll be honest, I wasn’t that bothered and wasn’t going to buy it. However, when I came round to placing my order on Friday they were running a 3 for 2 offer (valid until 10am on 24th November 2015) so I decided to add it to my order. I must admit, I was pleasantly surprised when I received the product. It was considerably larger than I thought and, upon opening the product, I noticed it had a fresh, clean scent to it. I had a few brushes from that morning that needed cleaning, as I had been pushed for time and hadn’t cleaned them. I also had some brushes that, despite numerous washes, just refused to clean up nicely and, in one particular case, the brushes still looked (and felt) caked with product and I was contemplating disposing of the brush. 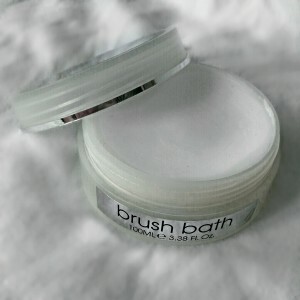 I set off into the bathroom with “Brush Bath” (as it is so called on the product label), brushes and “Brush Egg” (widely available, I got mine from eBay for £1), not knowing what to expect. I started off with my first brush, a large, fluffy, face brush that I had used to apply my powder. I followed the instructions which had said to: wet the bristles, swirl around in the soap, work in the palm of your hand* and then rinse. *I worked the brush on the Brush Egg. I was pleased with how quickly the brush cleaned up (I only needed to shampoo it the once) and, when I squeezed the excess water out and squeezed it in the towel, the bristles didn’t retain much water and also felt conditioned. I continued working my way through the few brushes I had to clean, including a buffing brush that I had used to apply my liquid foundation that morning. I shampooed this particular brush twice as I had really buffed the product into my skin, so I felt the product itself was pushed quite deeply into the bristles. Like the brushes I had cleaned previously, this brush came up perfectly clean and looking as good as new. I reached a stage where I had my blusher brush, the bristles of which were permanently dyed a light pink colour, despite many washes (they are supposed to be cream) and the aforementioned brush that I was considering disposing of. I decided on the lesser of the 2 evils and cleaned my blusher brush. I worked it up into a rich later and watched as the bubbles turned pink! When I rinsed the brush off I was very pleased to see cream bristles instead of pink (At the time of writing this the brush is now completely dry and looks as good as new). Deciding I couldn’t put it off any longer, and that the brush couldn’t really be in much worse of a state than it’s current one, I wet the bristles and swirled it around the Brush Bath. As I started lathering it up the bubbles got darker and darker (I’d used it for a cream contour shade), at the first rinse there was a noticeable difference and, by the second rinse (I decided to do it twice like I did with the cream foundation brush) I could hardly believe my eyes. The brush was spotless! The bristles were pure white again, and there was no oil residue feel to them either. The bristles were clean and felt conditioned, softer than when the brush was new even! I am beyond impressed with this product and will definitely be using it every time I want to clean my brushes. It reduced my brush cleaning time by, at least, half and turned an unpleasant chore, into something that really isn’t that awful to do. This was, by far, one of my best impulse buys and I would 110% recommend this product to anyone who has to clean makeup brushes, as your brushes will be the cleanest they have ever been and also be conditioned, soft and ready to use time and time again. I am in no way affiliated or financially involved with Freedom London, Makeup Revolution, Medichem International or any of their employees.